Working from my thoughts on the rustic and refined combination, I selected these pretty white dishes and the aqua colored ones too. I thought I’d do a mix and match sort of thing. 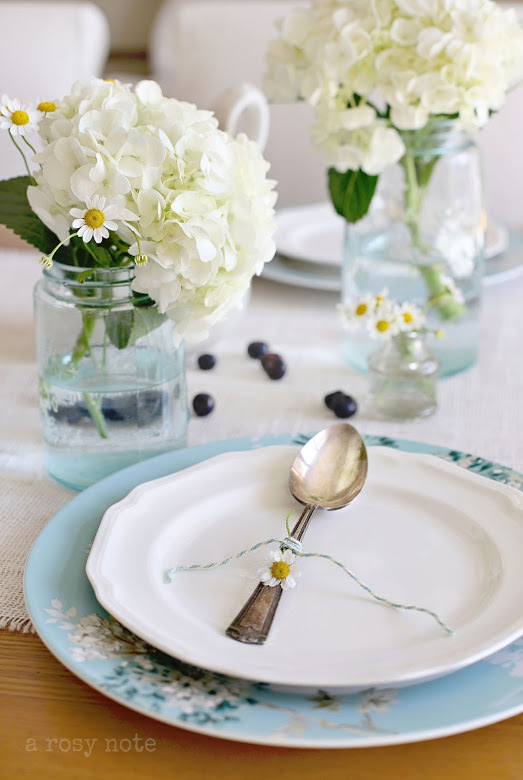 The flower patterned plates perfectly match those vintage Ball jars, don’t you think? That was a happy discovery. I think I’m going to have to expand my collection of antique flatware…if you can call six spoons a collection. Trying to come up with a way to incorporate those lonely spoons into the mix, I decided to tie a little camomile flower around the handle with a piece of baker’s twine. It’s a fancy meets farm sort of thing. And since I’ve been on a blueberry frenzy lately, so I thought I might as well use some of those too…blue jars, blue plates, blueberries. Yep, it works. I bought that white ceramic basket that they’re in from Anthropologie recently. I have a smaller one too. They’re so nice for displaying fruits and veggies. You can find Mikasa at Macy’s and Bed, Bath and Beyond stores. The two patterns shown above are called Antique White and Silk Floral. Beautiful! 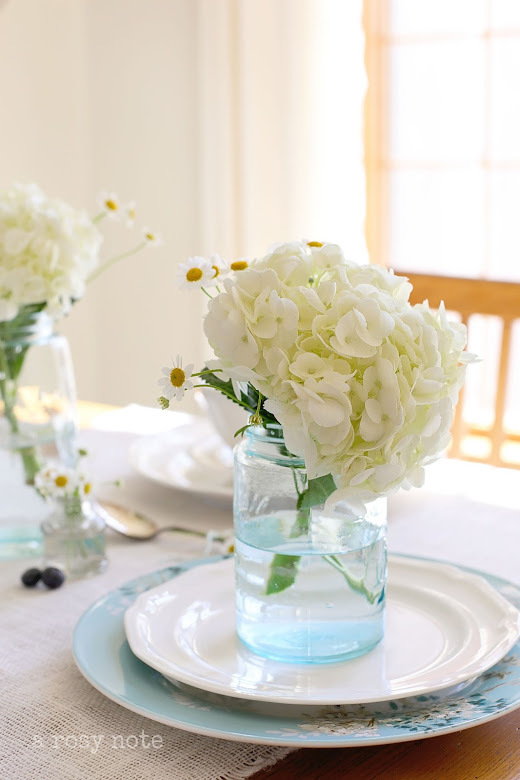 I love the new dishes and the daisy and hydrangea combo in mason jars! The photos are gorgeous and overall, it is an outstanding tablescape! It's always a gift to my eyes when I visit you. Blue makes me happy – in every way. So lovely — I love Mikasa dishes! Those pale blue jars are so beautiful! You have a way with light and colors in your photography. Tricia, these photographs are just beautiful! I love those blue Ball jars. As I've said before, your photos should be in a book….or a magazine….somewhere "out there"! Just beautiful! You have the most wonderful decorating sense. beautiful as always tricia. these are perfect images to lift my spirits on this gloomy, rainy day. Chuckling about your last sentence, just finished taking pictures and I was thinking about what shows up. Anyway, beautiful as always. Cold and rainy here and your pictures did brighten my day. Ohhh how pretty! I love the colors and the simplicity. Perfect Spring tablescape. Wishing you a lovely Spring day. Beautiful images. I love looking at your house… I need to ask you, what is the color of your dining room walls? Such pretty soft colors…beautifully arranged and so wonderfully photographed. The blue and white is a beautiful combination. Beautiful photos! I really like the Silk Floral plates. They match so well with your Ball jars. I didn't even notice the antennas. 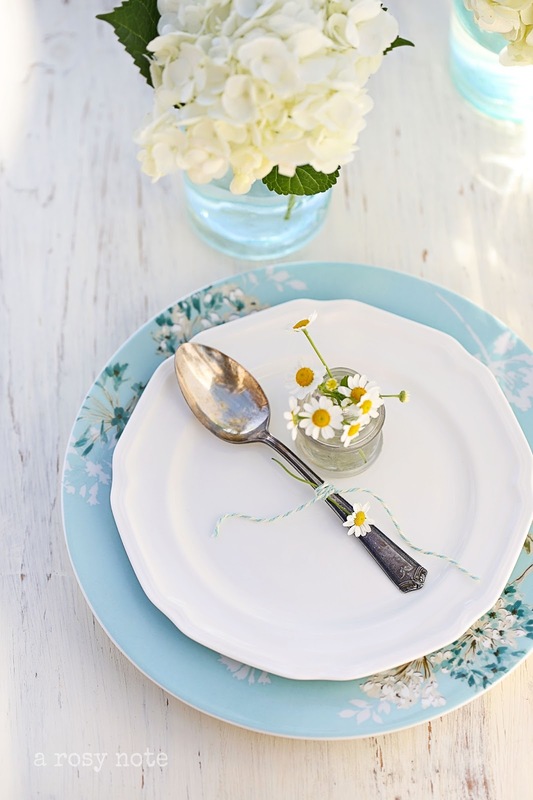 Those humble little daisies perfectly set off the blue and white plates, don't they? I have been hankering after soft blues recently – celadon in particular – and your beautiful pictures have inspired me greatly, thank you. I love the hues of aqua, such an amazing spring table, fresh and lovely! Love these photos, so fresh and springy! What beautiful images! I love the breezy feel of your table! Really pretty photos, Tricia! Cream and blue is SO nice together and I love the way you added the tiny daisy flowers. What pretty blue plates, too. I am on a blueberry kick, too ~ I love putting them in a buckwheat pancake mix or just mixing them in Fage Greek yogurt. Have a nice weekend! Gorgeous photos! Love the pops of blue! I agree with you…you do need to find some more vintage flatware. 🙂 It has such wonderful patina! Such beautiful pictures as always, these are so pretty and certainly cheer me up! Trica you've outdone your self – AGAIN. Such a pretty tablescape, your talent for arranging and photo taking just blows my mind. I love the blue floral plates. Normally I would have thought the white plates would have caught my attention but putting them together makes me want both! Next they will be asking you so use your photos for a print ads they are just so pretty. Tricia, these photos are gorgeous! They have EVERYTHING I ADORE in them. What you have combined here is amazing. 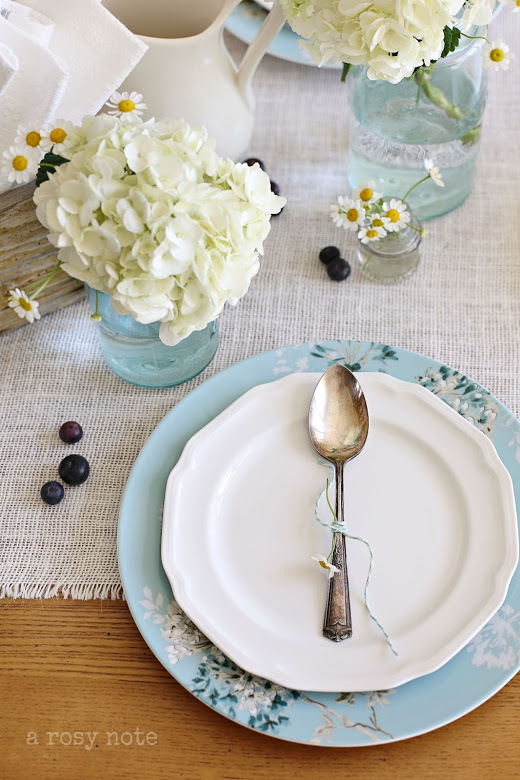 I'm not generally a fan of blue, but your tablescape is so pretty. Thanks for sharing. I just discovered your blog through Tulla and Catie. How pretty is is!! Oh girl, you did Mikasa well!!! You have such a way with all that you do. Those dishes are just beautiful and how you used them is perfect! Oh Tricia…everything about this is simply beautiful! Your blog is amazing!!! I have to learn from you! Oh so pretty! Love the light on the table shot! So very beautiful. Love the blue jars. Yes I told Laurie that my husband had to make me one table like her`s. What time does the party start? I'm there! BEAUTIFUL! Dearest sweet tricia, i am loving this gorgeous set up so much! Everything is so sweet and beautiful! Very inspiring as always! Have a lovely merry happy Tuesday and a wonderful week! Love to you! I am following you and will be adding you to my bloggers of inspiration list. See you soon and all you inspire. It is absolutely gorgeous! I love ball jars and I love pairing them with fancy flat wear! antenna's ? LOL you are so funny Tricia dear. 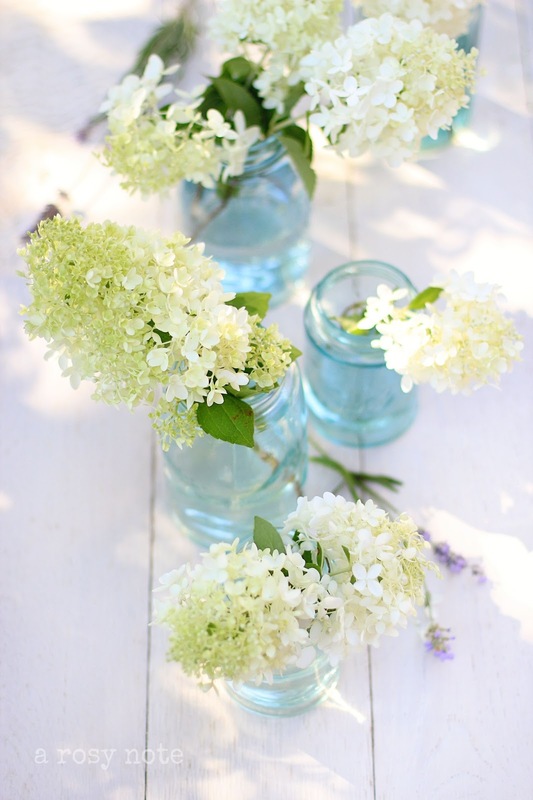 But I Love love love the blue ball jars that really complement the pretty Mikasa china so very well! Hey they can contact me anytime! No such luck, I'm sure. I received your lovely comment, and those pretty flowers were all here where I live. Just down the road a couple of miles, and actually the whole town looks like this for about a month in the Spring, just so beautiful you can't believe your eyes. I want to email you so badly and I will very soon! Your Mikasa dishes and flowers and jars and spoons are matches made in heaven. These photos are simply glorious! The pairing is perfect! And the colors in this posts are a breath of fresh air. I think I'll be coming back a few times just to look at your photos. Now I'm tempted to check out Mikasa. I've been looking for dinnerware this color… seriously. It all goes so well together, nice choice of the dishes and of course I love blue ball jars. So beautiful, simple, soft, and elegant all together! Mikasa mentioned your post on Facebook so I popped over here. I am now a new follower – love this tablescape. Beautiful pictures and arrangements. Light and innocent look. Very nice. Very lovely – and you were right, this fits in beautifully. I hope they let you keep some of it because it looks right at home in your house! I love this table setting so much! Beautiful styling. The table setting, colors, and photos are so pretty. My favorite thing you did is the bakers twine a d chamomile flower…so sweet! Gorgeous gorgeous sweet friend!! Sharing at the party tonight- thanks for linking up at Feathered Nest Friday!! Oh you just make my heart sing! Gorgeous combination of items old and new! Well done!!! Tricia – What a beautiful table setting. 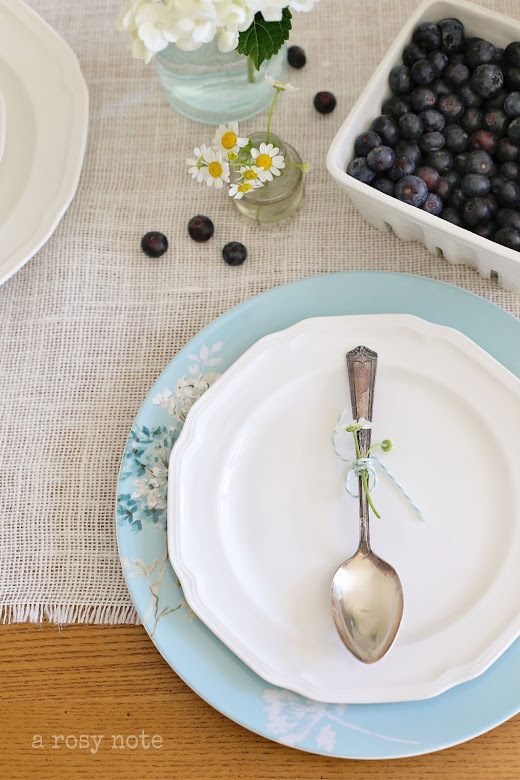 The dishes are so pretty and look like they were made to go with those blue Mason jars. Those jars are so adaptable to any surrounding. Thanks for your kind comment on my post about finding God's will and purpose. As always, your posts make me happy. So beautiful every time. Serene, peaceful, beautiful and happy are emotions I feel when I view your photos. I relax as I scroll and drink in the beauty. I think you must be sweet, gentle and kind. I found your blog on Brenda's spotlight post. Your photos are so lovely and your staging is just wonderful. I am still learning about photography so I will be studying your photos for ideas. I found you through Brenda's page. I would love to have the stunning photos you share here. I am still learning with our Canon Rebel and hope one of these days I can share such beautiful photos too. Thanks for sharing. Loving your blog….gorgeous photos! I am your newest follower! Also, I just wanted to stop by to let you know of a GIVEAWAY being hosted by Koralee from Bluebird Notes blog to help celebrate the opening of my new Etsy shop: Daisy Pink Wish…….if you have the time please stop by…..we would love to see you enter!